Keto flatbread! 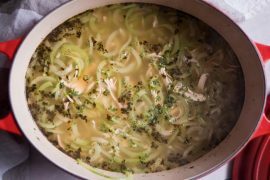 It’s soft, delicious, and only one total carb per serving! 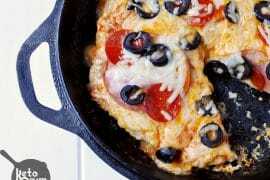 This keto flatbread recipe was inspired by the fathead pizza dough we all know and love. It’s just as simple to bake, but with a few minor tweaks, it’s an entirely different dish! 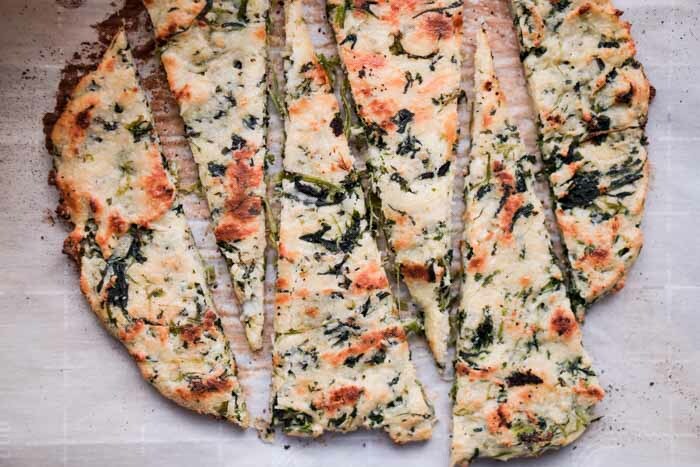 Stuffed with spinach and topped with garlic, this flatbread is sure to put a smile on your face. How is this different than fathead pizza dough? 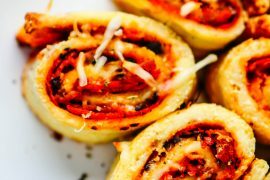 The keto flatbread is a little cheesier than the fathead pizza dough, making it slightly more pliable. The amount of almond flour was reduced to give the bread some extra flex. 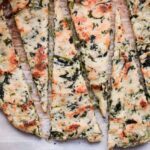 Depending on how long you bake it, you could enjoy an excellent crispy flatbread to pile other ingredients on top or a soft, pliable keto pita bread. If you want it crisp, just keep it in the oven longer. If you want to use the dough to form pitas or thick tortillas, cut the bake time short. Test it out and see how you like it best! Spinach is one of my favorite low carb vegetables, so naturally, I added some to the dough. 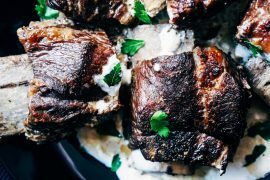 You can try it with spinach, leave it out, or sub in your own favorite keto vegetable. 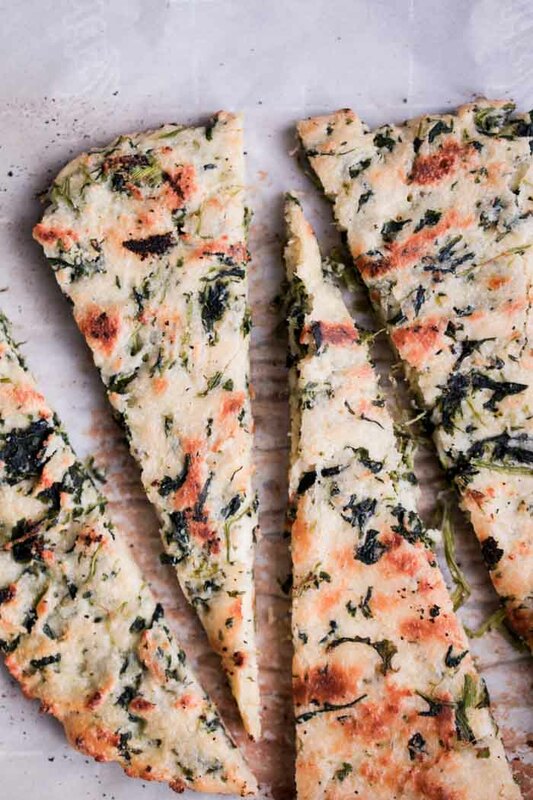 The flatbread is perfect as-is, but I think it’s pretty cool that you can use for so many different things and tailor it to your flavor preferences. It’s a strangely versatile dough to play around with. Unlike other low carb baking projects, it’s incredibly forgiving. If your baking chops aren’t up to speed, don’t worry. 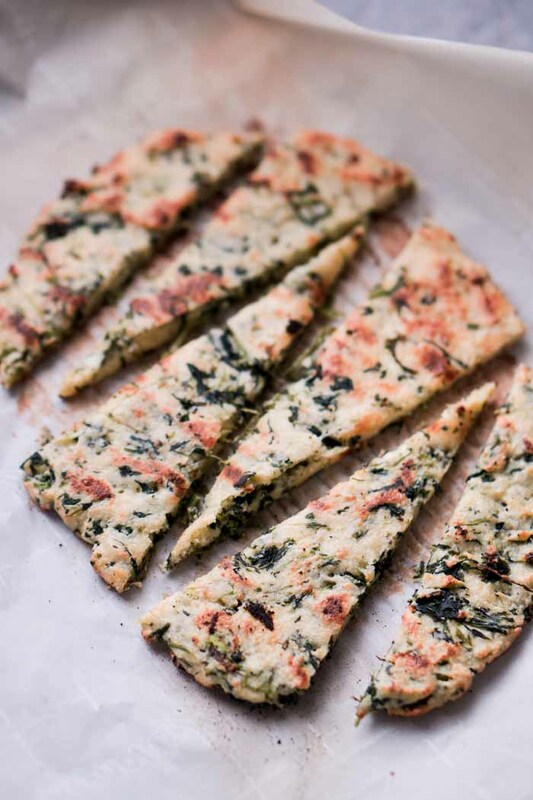 This keto flatbread is a really easy recipe to pull off. If I can do it, so can you! 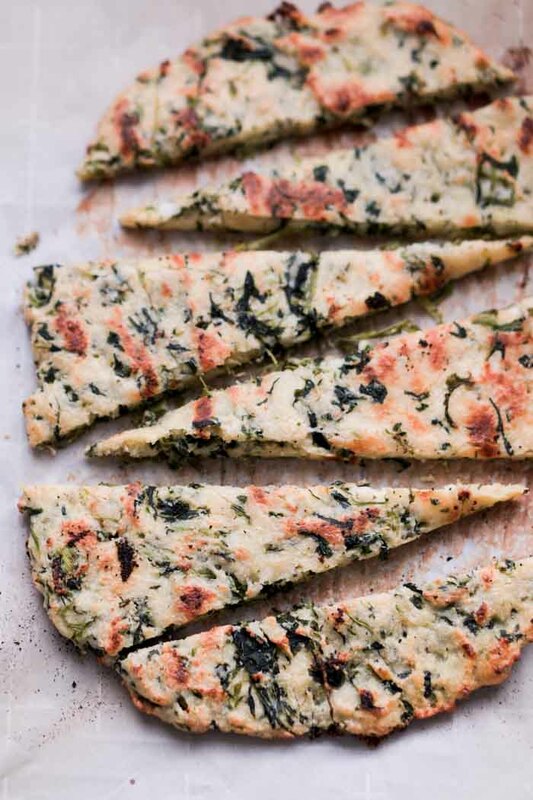 This keto flatbread is low in carbs and stuffed with spinach! In a microwave-safe bowl, melt mozzarella cheese and cream cheese in the microwave in 30-second bursts, mixing to combine in between intervals. 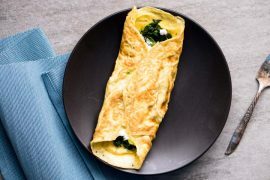 Once the cheese is completely melted and combined, mix in egg, almond flour, and spinach. Flatten the mixture out on top of a baking sheet lined with parchment paper. Sprinkle garlic powder and salt on top. Bake for 15 minutes, then flip the flatbread to bake for an additional 5 minutes to crisp the other side. How thin do you flatten it? I made this yesterday and had it with delicious homemade hummus. It was so good I’m making it today as well! One thing I wondered about, though, is how much (preferably in grams) is one serving? Yes I would like to join if it is free. 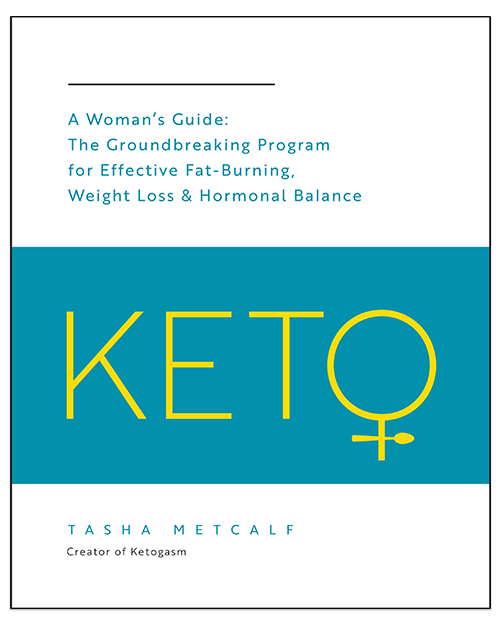 I am just getting started on keto and so far I’m doing good. But I need to get more recipes. 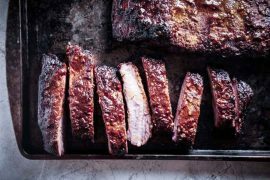 How much, exactly, is one serving of Keto Flatbread? Nutritional Facts are for one serving, they it doesn’t say how much that is. how long does this bread last? Do you store extras in the fridge? How is the best way to store the bread when its plain or a spinach kind.. leave it out or refrigerate? I made this and it was delicious.. I’ve done all different kinds.. diced salami, prosciutto, shrimp.. delicious.. thank you.. I made it without the spinach, and put basil and rosemary in it instead. It is fabulous! How should I store it, though? I made 2 batches, so I won’t be eating it all in one meal. I would do zipper lock bags in the fridge, just to be safe. Since it’s homemade and there’s dairy, I would store any leftovers in the fridge for sure. Can it be made without the spinach? I can’t do the cheese . Can you recommend something else? You can sub yogurt for the cream cheese or use vegan cream cheese and vegan mozarella. This was amazing! I was a little skeptical , but it turned out great ! Once I flipped the flatbread I added a little extra mozzarella and garlic powder and made garlic bread ! Can’t wait to make pizza with this ! Thank you for all the great recipes !